My heart sank as soon as Dr. Liz mentioned Stanford’s cataracts. She was examining him before his routine rabies shots when she noticed the cloudiness in his otherwise cheerful eyes. It was the first time anyone had mentioned anything about cataracts. “Is it something serious? Something we need to be concerned about?” I worriedly asked. We’ve always wondered how old Stanford is. We think he is either six or seven, and now that he’s started to develop cataracts he may even be older. It’s one of those things, I guess, that we’ll never really figure out — like why he has that nick in his right ear and that tiny scar near his left eye. Dennis believes he wrestled with a bear when he was out in the woods in Utah before he got rescued, which makes me actually proud to think that my little boy can stand up and defend himself. But it seriously breaks my heart whenever I picture Stanford out in the cold, in the dead of winter, prowling for food and searching for a warm place to sleep. It’s been three years since we adopted Stanford and since we’re not sure when his real birthday is, we pegged his adoption day as his birthday. I fondly remember the flight to Salt Lake City, the overnight stop in Winnemucca, and the long drive back to San Francisco. I remember driving across the Bay Bridge with a rescued corgi in the backseat. Stanford has this uncanny ability to lift my spirits up, even with a broken camera on the floor. His handsome face never fails to light up a room. Many say Stanford’s one lucky pooch but I think it’s the other way around. Dennis and I are the lucky ones to have found him — nicks, scars, cataracts, and all. To celebrate his birthday and our three years together I made Stanford blueberry pupcakes. Yes, judge all you want. I made my little boy cupcakes. 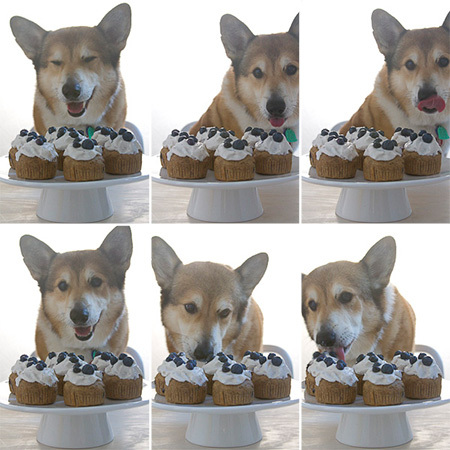 Liz Palika’s The Ultimate Dog Treat Cookbook: Homemade Goodies for Man’s Best Friend has a great recipe for blueberry cupcakes, which she calls pupcakes. She combines ground kibble with Jiffy blueberry muffin mix, which I replaced with whole wheat flour, baking powder, and honey. The pupcakes contain blueberries, which are an excellent source of antioxidants for your dogs. Here is a link to a recipe for another tasty dog treat, peanut butter oatmeal dog treats. Combine the ground dog food kibble, flour, baking powder in a medium bowl until thoroughly mixed. Add honey, eggs, milk and a cup of blueberries and mix until well combined. The batter should be slightly grainy. Grease or line muffin cups with paper baking cups. Avoid using foil baking cups. Paper ones are digestible in case your dog wolfs down the pupcakes before you take the paper cups off. Bake until a cake tester or wooden skewer inserted in the center comes out clean, 15 to 20 minutes. Let the pupcakes cool on a cooling rack. Whip cream cheese with 1/3 cup blueberries. 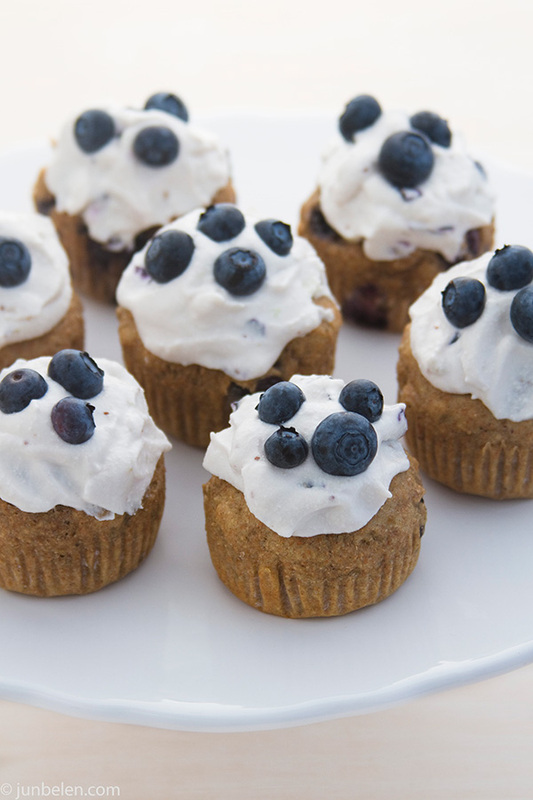 Frost the pupcakes with a thin layer of whipped cream cheese and top with a few blueberries. Remove the paper baking cups before serving the pupcakes. Stanford is absolutely precious with his pupcakes! Thank you!! He is one tough boy, that’s for sure. I’m just so glad we found each other! I love those little corgi legs!!!!!!! He did a fabulous job with the sheep too – I’d love to take Chase to see if she’d like it but then she’d probably become a fiend like she is with the disc. Tell Stanford happy birthday for me! Judge? I talk to mine like he can respond, I buy him every toy I see, and I’ve been known to ask about him before D. 😉 I’m not one to judge. I feel the same way about Bear… he came into my life at a time when I just needed to claw to the surface and breathe. When he enthusiastically greets me at the door, life is automatically much better. Happy birthday, Stanford! Thank you for sharing your Blueberry Pupcake recipe. We are going to make some! Thank you, Sammy! Let me know how the blueberry pupcakes go. It’s amazing how much calming effect our dogs have with us. Stanford’s smile just makes everything seem fine. I will! And tell Chase hello for me! Trina, thank you! The book recommendation is awesome! So many great recipes to try. Amd Jun, considering I celebrate my cat’s birthday with a special meal as well, I will never think of you as crazy. Just a kindred spirit when it comes to loving our furry family members. You’re such an awesome dad to Stanford–these pupcakes are adorable! My parents adopted a retired 4-yr old cocker spaniel from a breeder and she has cataracts, too. She’s the happiest little cutie, otherwise. Stanford is very lucky to have you and Dennis for his parents (and I’m sure you feel the same way about him). Love the picture of him licking the pupcake! By the way, I’ve passed through Winnemucca during our camping trips–small world! that is way-way too cute! happy birthday to the entire family! Happy birthday, Stanford!!!!! Luck, lucky dog! The cupcakes ALMOST look as adorable as the bday boy. Happy Birthday Stanford! I LOVE Corgis and hope to one day have one of my very own. Currently I have two 4 leggers that keep me very busy. One who’s 6th bday is coming up, so I was looking online for pupcake recipes. I may just make this one for him next week as he LOVES blueberries! Thanks for sharing!!! !